I should have done these guys for day 100! Hindsight is 20/20,as they say. Today's doll is a pair of tiny little guys. These little men measure only about 2 inches tall. They could be easily mistaken for Crackerjack prizes or gumball machine toys. The reason I should have done them for Day 100 is that they are actually dolls that were sold as part of a set of '100 dolls'. That's the way they were advertised, usually in comic books. 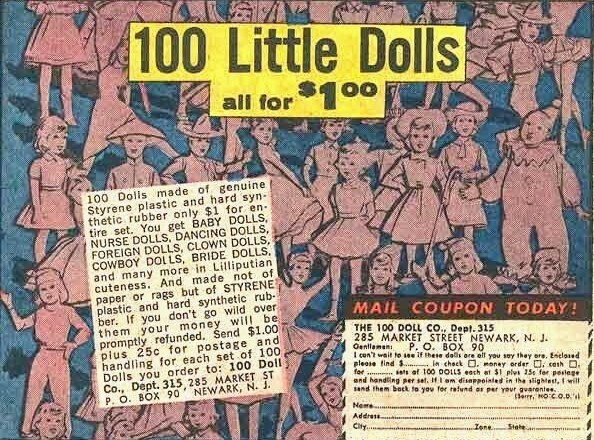 The ad proclaimed '100 little dolls all for $1.00'. Well if it sounds too good to be true, it probably is. But little kids,like me, were suckered into this one. 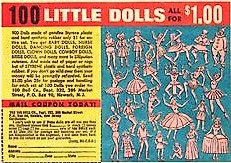 I ordered the '100 little dolls', and was very disappointed when they arrived in a small packet,all solid pink plastic,with no painting. The ads made them look much more interesting. They describe them as being made from 'styrene plastic and hard synthetic rubber'. That sounds like they would be made of two different,and detectable types of materials,making them more interesting. Uhhh...NO! The 'paper and rags' might have been more 'doll like'. I did another post a while back on a different '100 dolls' doll. You can see that post HERE. Those dolls were at least more detailed and made of a better plastic. At least they're molded on both sides. The guy on the left looks like he was injection molded,all in one piece. But the Russian fella on the right gives it away: two separate molded pieces stuck together. You can tell by the unmolded front of his back half that shows from the front. Maybe they used two methods? And how am I feeling today? It's one step forward and one step back again with this stuff. I thought a few days ago that I would have been back to normal by today. But today I feel worse than yesterday. I might have felt better with a solid night's sleep,but constant coughing fits and the accompanying trips to the bathroom have left me drained today. And chilly! It has turned a bit colder today. It's only 59 degrees Fahrenheit,and the rain this morning has left everything wet, and feeling even colder. All I want is to get warm and go to sleep! See you tomorrow for another doll. Sorry you are not better. Thanks for keeping the lessons going. 100 tiny dolls is an interesting concept. I wonder what they thought a child would do with these dolls. Do with them? Mainly pay them money for them I think! I suppose these are made a bit like the plastic toy soldiers that kids used to play with...wonder if they still do? I think the play value would be less though that a platoon of soldiers. I'm not sure I would want to have 100 of these but I suppose if someone were looking to collect one of each one, they might enjoy them.